Phew! We're finally getting into the Halloween spirit around here. I still need to pull the decorations out of storage (they're trapped underneath a pile of truck tires, Christmas stuff, and old toys, so... it might take a while), but costumes are bought, and a trip to the pumpkin patch is in the works. But, of course, a holiday isn't a holiday without some themed baking. 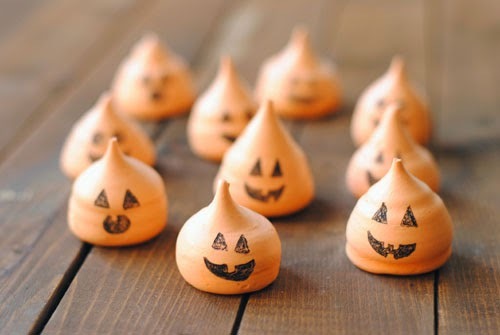 These little pumpkins are the best because they're fat free, small, and adorable. They only take about 15 minutes of prep, and the baking and cooling time is completely hands-free. And the best part? Kids love to draw on the crazy faces, making it a family activity. We're all about the quality time. (Especially when it involves dessert). Pour into a (very very) clean bowl of a stand mixer, and add any flavouring, if desired. Beat on medium for a few minutes, and then add the food colouring. It’s okay if it’s quite dark orange – it will lighten up considerably. Using a large pastry tip, pipe the meringue into large, plump circles, about an inch wide, directly onto the parchment. Bake for 1 1/2 to 2 hours. When ready, they'll be crisp and not stick to the pan. If they begin to crack, the oven is too hot, so either turn it down or keep the door open slightly. Once they're ready, turn off the oven and let everything cool down together inside. 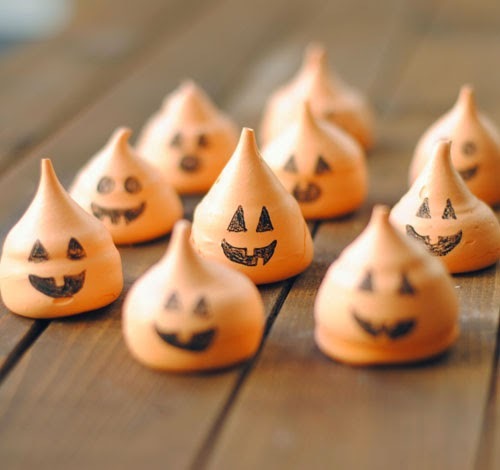 Once cool, draw jack-o'-lantern faces onto the meringues with an edible food marker. Store in a cool, dry place.